To ensure that your conservatory or orangery is genuinely usable throughout the year, it is important that part of the survey of your home, is to check its aspect of your proposed conservatory, or which direction it will face. Conservatory glazing in a north facing conservatory should provide excellent insulation to reduce heat loss and conservatory glazing in a south facing conservatory should provide more protection from solar heat gain. A detailed survey, together with an appreciation of the customer requirements for their new conservatory will determine the appropriate conservatory glazing for the conservatory windows and doors as well as the conservatory roof. Efficient conservatory glazing provided by ‘A’ rated conservatory windows and doors may reduce heat loss and it is probably more important in conservatories and orangeries where there is a greater area of glass than it is in the windows and doors of your home. Energy efficient conservatory glazing in the conservatory roof will prevent rising heat from escaping during cold periods, whilst solar control glass can reduce solar heat gain on hot days. Properly specified conservatory glazing is very important as only by achieving effective heat insulation and protection against solar heat gain, can your new conservatory or orangery be considered to be truly usable throughout the year. Whether the windows installed in your conservatory are outward opening casements, inward opening tilt and turn designs or sliding sash style, your conservatory glazing should include argon-filled sealed units with low emissivity glass and a warm edge spacer bar to reduce heat loss. Where the conservatory frame type permits, this will provide ‘A’ rated energy efficient windows and should definitely be the choice of conservatory glazing for north facing conservatories. At the time of building this website, doors were predominantly ‘C’ Rated for energy efficiency. This is mainly due to the fact that most residential doors have PVCu panels fitted which could not match the performance of the best insulated glass sealed units. Most conservatories and orangeries however, tend to have fully glazed doors – whether these are single or double doors (French doors), sliding patio doors or bi-fold doors. If the doors are fitted with the same specification of insulating glass sealed units as the ‘A’ Rated windows then the conservatory glazing in the doors of your conservatory will provide a similar energy efficiency capability. Due to their large size when compared to outward opening casement windows, inward opening tilt and turn windows are an ideal choice for south facing conservatories which require lots of ventilation. When opened inwards in the tilted position they direct a breeze towards the hottest part of the conservatory – the roof space. When hinged inwards in the ’turn’ position, a tilt and turn window offers almost as much ventilation as a door – in fact some fabricators are able to manufacture a tilt and turn window which is the same size as a door. The other advantage of tilt and turn windows is that because they are not subject to the same size constraints as a casement window, there is often no need for the horizontal transom bar in a window, which is usually in the line of sight. Conservatory glazing in the vast majority of conservatories and orangeries will be either glass or polycarbonate and both have advantages and disadvantages which need consideration prior finalising your specification. Although polycarbonate sheets are lighter, less expensive but noisier when it rains – if a glass roof is specified for your conservatory glazing it will require stronger roof spars due the extra weight of glass. Both can reduce solar heat gain (when compared with clear glass or clear polycarbonate) but only glass can be manufactured with an external self-cleaning surface – at the moment! The overriding advantage of glass over polycarbonate sheets for your conservatory glazing (at least in the opinion of staff at Just a Quote) is that glass can be seen through. Glass may not offer the same privacy as some types of polycarbonate, but being able to see the ever changing sky can only add to the pleasure of being in a conservatory, with the large glazed areas offering a greater sense of space. Polycarbonate sheets are manufactured so that they trap air inside several layers which provides insulation and they can be anything from just 6 mm thick to over 50 mm thick and have from two layers to ten. Polycarbonate for conservatory glazing comes in a variety of colours (clear, opal and bronze are the more common ones) to match your window, door and roof frames. For PVCu window, door and roof frames which have a woodgrain effect outside but are white inside – there are types of polycarbonate to match – bronze outside and opal inside. Different types and thicknesses of polycarbonate also have different insulation qualities and solar protection qualities. If the intended use of your conservatory is an office, polycarbonate roofing material is probably not a good idea – during torrential rain you would have difficulty holding a telephone conversation due to the noise of rain on the roof panels. Using glass for conservatory glazing in the conservatory roof offers just as many variations for roof glazing as polycarbonate does – though insulating glass sealed units can be argon-filled whereas polycarbonate sheets cannot. 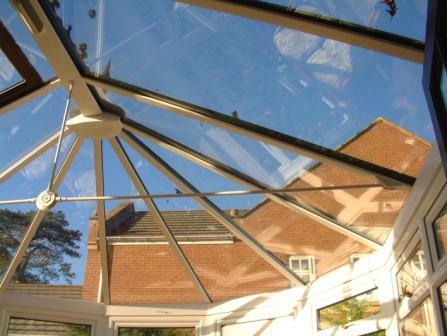 Generally it is inadvisable to install ordinary clear glass in a conservatory roof as even in north facing structures the sun is directly overhead for at least part of the year.